Purple hull peas, a Southern favorite, are a variety of cowpeas, a plant of the pea family where both the pod and seed are edible such as black-eyed peas and crowder peas. The purple hull pea pod is long and thin and is a deep purple color (hence the name). There are a few different varieties, most of which produce pink-eyed beans. If you can't find fresh shelled purple hull or black-eyed peas for this recipe, use dried or frozen purple hull or black-eyed peas and cook them as directed on the package until tender. In a medium skillet or saute pan, heat the oil over medium heat. Add the onion and garlic and saute until softened, 3 to 5 minutes. Transfer the onion and garlic mixture to a medium saucepan; add peas and chicken broth. Cover and simmer over low heat for 30 minutes. Meanwhile, slice or dice the sausage. Put in a skillet and cook, turning, until brown on all sides. Add to the peas, cover, and simmer for 20 minutes longer, or until peas are tender. Uncover the saucepan and increase the heat to medium so the mixture is at a low boil; continue cooking for about 3 to 5 minutes to reduce slightly. Add kosher salt and pepper as needed for flavor. Serve the peas with freshly baked cornbread. Whether you are from the South and are familiar with this type of pea, or have never heard of it before, it may surprise you to know that the purple hull pea is actually more closely related to beans than peas. It is believed that this cowpea, or Southern pea, came over to the U.S. during the slave trade from Niger, Africa, and started out as food for the black community as well as feed for the livestock (which is why they are called "cowpeas"). Soon after, however, the white population became attracted to the purple hull pea as well and it has become a part of Southern cuisine ever since. The peas grow in three different ways: vining, semi-vining, and on a bush, and each variety of growth has several types of purple hull peas. In most cases, you will come across pinkish-colored peas, but there is one variety in particular—the Knuckle Purple Hull—that produces brown peas that are a bit larger in size. 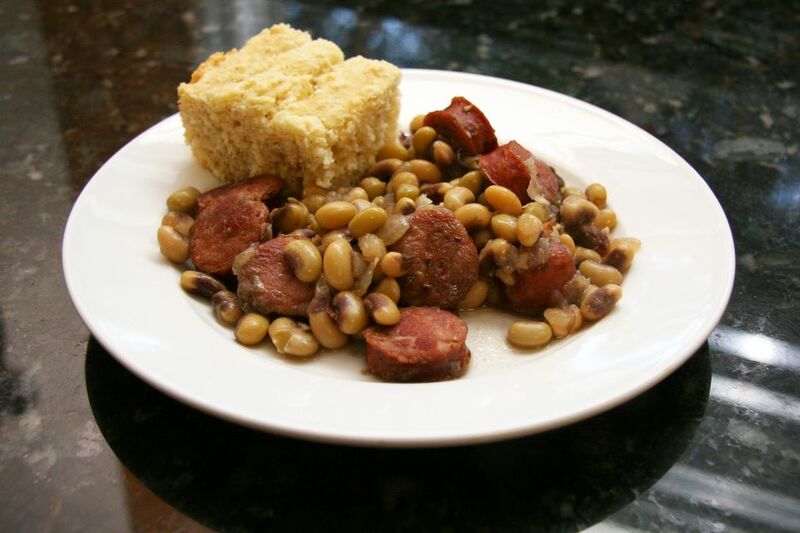 A typical recipe using purple hull peas is with ham hocks, similar to traditional black-eyed pea dishes.